Canine Parvovirus (more commonly known as “parvo”) is a highly infectious, potentially lethal infection of dogs. We tend to see it in puppies causing severe intestinal disease, but any unvaccinated dog is potentially at risk. A virus called (unsurprisingly!) the parvovirus – more specifically, Canine Parvovirus 2. There are a number of different strains out there, but CP2b is probably the most common. The virus attacks the intestinal tract and the immune system; some strains also attack the heart muscle (although this is relatively rare). The virus is very resistant, and can live in the environment for a very long time (perhaps as long as a year in some situations). It can be spread directly from dog to dog, but more often a dog contracts the virus when they come into contact with faeces from an infected dog – either directly or even on someone’s shoe. The virus is relatively difficult to destroy as well, so if you have a dog who is recovering from the disease, talk to our vets or nurses about how to safely disinfect your home. It is most commonly seen in puppies between 6 weeks and 6 months old. In younger puppies, they are usually protected by their mother’s immunity; whereas older dogs are protected by their vaccines (or residual immunity if they have been lucky enough to survive the infection). Some breeds are at particularly high risk, especially German Shepherds (possibly due to a weaker intestinal immune system) and Rottweilers (where, it is thought, their mother’s immunity lasts longer, preventing the routine vaccines from working quite as well). In most cases, the virus causes severe vomiting and diarrhoea. The diarrhoea starts out watery, but soon becomes blood-stained and may even include strips of dead intestine. This leads to severe dehydration (which is what kills most infected dogs). However, at the same time, the virus is attacking their immune system, meaning that other bacteria can invade the body, causing septicaemia. Infected dogs are often unable to keep any fluid down, and are very weak, and usually start to mount a fever. As the virus progresses, however, their body temperature drops, then they collapse and often die, sometimes within a few hours of the first symptoms appearing. 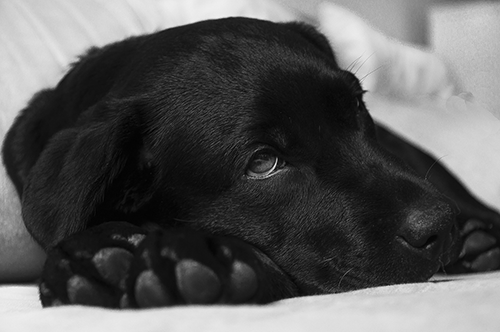 There is a second syndrome that parvo can occasionally cause when it attacks the dog’s heart. Affected dogs may just die, suddenly and unexpectedly; alternatively, they may show signs of heart failure (reduced ability to exercise, coughing, difficulty catching their breath, blue gums). Fortunately, this form is relatively uncommon. How does the vet know that a dog has parvo? Dogs and puppies with intestinal parvo have a very characteristic smell, caused by the dead, rotting intestinal lining. That smell alone will probably sound warning bells to any of our vets, and they will then confirm the diagnosis with a “Parvo SNAP Test”. This is a quick test that we can do in house (it only takes 10 or 15 minutes! ), where we put a little bit of blood, faeces, or even a swab from the dog’s bottom into a little test device. The device then tells us whether there are parvovirus particles in the sample. · Intravenous fluid therapy, to counteract the dehydration. In very small puppies, their veins may be too small to put them on a drip normally, so we may have to place an intraosseous line, where we run the fluid into the bone marrow instead. · Anti-vomiting drugs, such as maropitant or metoclopramide. The sooner the patient can start drinking and, if possible, eating again, the better – so we try to suppress the vomiting. · Antibiotics – although these won’t work against the virus, they will prevent bacteria from invading the bloodstream, causing septicaemia. · Intensive care nursing – in an isolation ward, to minimise the risk that they will infect any other dogs. The vets and nurses treating the patient will wear gowns, gloves and overboots, and will carefully disinfect themselves after every check. Although there is no cure for the virus, there is a drug called interferon which helps to rally the immune system against the virus. Although very expensive, it does improve the survival rate – even with treatment, 30% or more of affected puppies would be expected to die. How can I protect my puppy? Vaccinate them! The Parvo component of a dog’s routine vaccinations is very effective and very safe. If your dog is of a high-risk breed, talk to one of our vets about an extra Parvo shot at about 12 or 14 weeks, as well as the routine 8 and 10 week doses. If you think your dog may have parvo, call us for advice right away.